Birth Walter Thurley was born in 1878 in Bishop's Stortford, Hertfordshire, EnglandBG. Walter Thurley appeared as the brother of Joseph Thurley in the 1911 English Census at 39 Oaks Street in Bishop's Stortford, Hertfordshire, EnglandBG. Death He died on 18 November 1939 at age ~61 at Basbow Lane in Bishop's Stortford, Hertfordshire, EnglandBG. 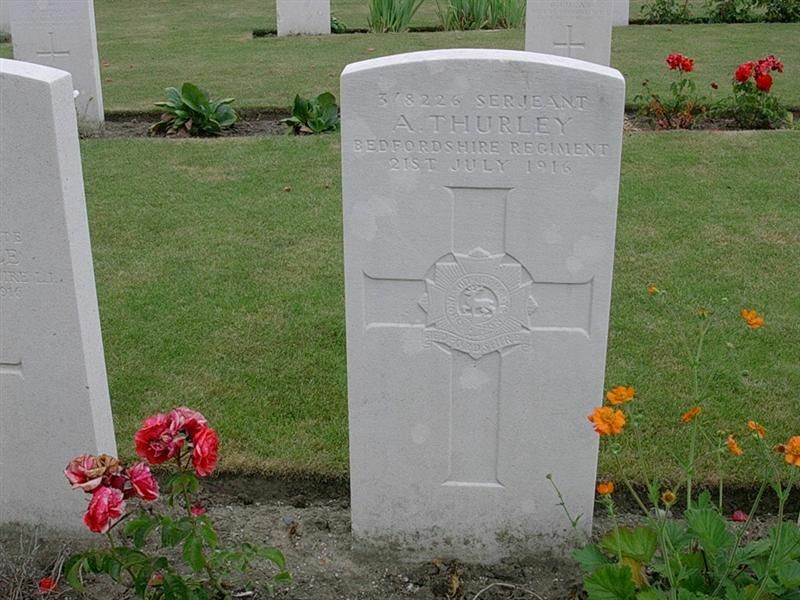 Birth Aaron Arthur Thurley was born in 1880 in Bishop's Stortford, Hertfordshire, EnglandBG. English Census 1911 He appeared as the Head of the Household in the 1911 English Census in Bishop's Stortford, Hertfordshire, EnglandBG. Death He died on 21 July 1916 at age ~36 at Pozières Memorial Cemetery in FranceBG. 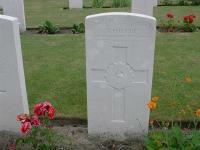 Burial He was buried on 21 July 1916 in West-Vlaanderen, BelgiumBG. Wife She appeared as the wife of Aaron Arthur Thurley in the 1911 English Census in Bishop's Stortford, Hertfordshire, EnglandBG. Birth Ellen Thurley was born in 1882 in Bishop's Stortford, Hertfordshire, EnglandBG. Marriage Benjamin Wakelin and she were married on 17 January 1903 at Holy Trinity Church in Bishop's Stortford, Hertfordshire, EnglandBG. Birth Benjamin Wakelin was born in 1879. Marriage He and Ellen Thurley were married on 17 January 1903 at Holy Trinity Church in Bishop's Stortford, Hertfordshire, EnglandBG. Birth Rosa Thurley was born in 1885. Marriage James Thurley and Jessica Mears were married. Birth He was born in 1887 in Bishop's Stortford, Hertfordshire, EnglandBG. Marriage He and Lydia Mears were married on 2 September 1916 at Holy Trinity Church in Bishop's Stortford, Hertfordshire, EnglandBG. Death He died in November 1950 at age ~63 in Bishop's Stortford, Hertfordshire, EnglandBG. Birth She was born in 1886. Death She died on 15 January 1957 at age ~71. Birth Lydia Mears was born in 1895. Marriage James Thurley and she were married on 2 September 1916 at Holy Trinity Church in Bishop's Stortford, Hertfordshire, EnglandBG. Death She died in August 1924 at age ~29. 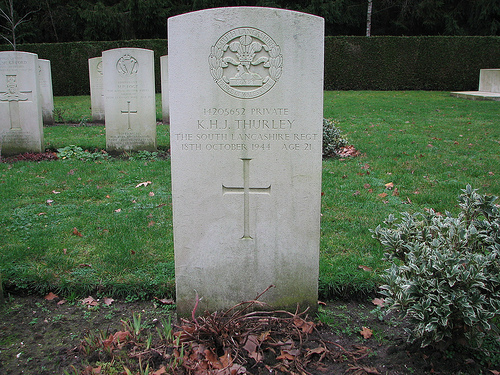 Birth Florry Thurley was born in 1889. Birth Alfred Thurley was born in 1893. Birth Reggie Thurley was born in 1903 in Bishop's Stortford, Hertfordshire, EnglandBG. Death He died in 1903 at age ~0 in Bishop's Stortford, Hertfordshire, EnglandBG. Son He appeared as the son of Joseph Thurley in the 1911 English Census at 39 Oaks Street in Bishop's Stortford, Hertfordshire, EnglandBG. Marriage Alec Thurley and Hilda M Taylor were married in 1933 in Dunmow, Essex, EnglandBG. Death He died on 10 July 1970 at age 65 at 39 Oak Street in Bishop's Stortford, Hertfordshire, EnglandBG. Marriage Alec Thurley and she were married in 1933 in Dunmow, Essex, EnglandBG. Birth Alwin Thurley was born in 1908 in Bishop's Stortford, Hertfordshire, EnglandBG. Death He died in 1908 at age ~0 in Bishop's Stortford, Hertfordshire, EnglandBG. Birth Cedric Thurley was born in 1908 in Bishop's Stortford, Hertfordshire, EnglandBG. Son Bertie Archer Thurley appeared as the son of Joseph Thurley in the 1911 English Census at 39 Oaks Street in Bishop's Stortford, Hertfordshire, EnglandBG. Birth Ruby Thurley was born on 13 August 1899 in Bishop's Stortford, Hertfordshire, EnglandBG. Daughter She appeared as the daughter of Joseph Thurley in the 1911 English Census at 39 Oaks Street in Bishop's Stortford, Hertfordshire, EnglandBG. Residence Prior to the war Kenneth Howard Joseph Thurley lived at 8 Portland Place in Bishop's Stortford, Hertfordshire, EnglandBG. 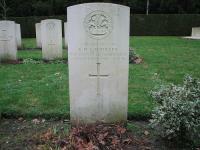 Burial He was buried after 18 October 1944 at Venray War Cemetery in Limberg, NetherlandsBG. Birth Frederick George Thurley was born in 1894 in Bishop's Stortford, Hertfordshire, EnglandBG. Chr He was christened on 25 February 1894 in Holy Trinity, Bishops-Stortford, Hertford, EnglandBG. Birth William Thomas Thurley was born in 1895 in Bishop's Stortford, Hertfordshire, EnglandBG. Death He died in 1895 at age ~0 in Bishop's Stortford, Hertfordshire, EnglandBG. Chr He was christened on 25 July 1895 in Holy Trinity, Bishops-Stortford, Hertford, EnglandBG. Burial He was buried on 14 August 1895. Birth George Thurley was born in 1897 in Bishop's Stortford, Hertfordshire, EnglandBG. Birth May Thurley was born in 1898. Marriage William Field and she were married on 28 April 1926.